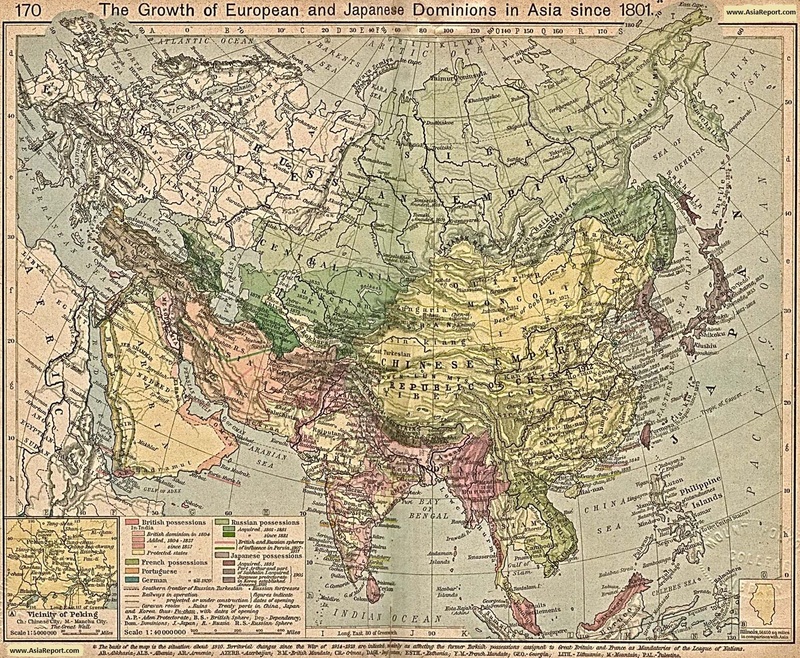 A Full overview Map of the Eurasian continent showing its various cities and nations in the 19Th Century, the (growing) Colonial possessions throughout Eurasia, North Africa and the Middle-East, and the growth of Colonial enclaves, possessions and protectorates between 1801 AD and 1900 AD. 1) The first zone of interest lies in the South where -after a blockade of the overland trading zones of the Silk Road to and from China- maritime European Nations have embarked on their "Age of Discovery" (early 15th century to early 17th century). Along the southern Route from the West to the East (China) trading post and fortresses are gradually turned into strongholds, bases and colonies or protectorates. 2) The second zone of interest lies in the North. There, expanding Eastward from Russian Territory and the Capital Moscow, the Russian Empire saw its rise as a major power within Eurasia. Continuing throughout the 19Th Century and culminating in the construction of the trans-Siberian railway in the 1890′s, Russia completes its northern encirclement of Qing Dynasty China (1644 AD - 1911 AD). 3) Rising last is the Empire of Japan, which after a rapid industrialization in the early 19Th Century will go on to annex the Island of Formosa, the Qing Dynasty Chinese protectorate of Korea in its entirety and move on to annex most of North-East China (Manchuria). Notably: although not included in detail on this Map, this Era also saw the colonialist expansion of the United States of America. At the End of the 19Th Century the United States of America will rise as a Colonial Power entering the theatre via the Philippines (1898 AD) and Japan. For full details on Treaty Ports, the year of annexation or forced opening and additional information see below this Map. Designates Japanese Treaty Ports, Concession. Designates Russian City or Russian Controlled Territory. Designates Colonial Possession or Territory in Asia. This Map is optimized for viewing in Microsoft Internet Explorer - Switch ur Browser for Full Functionality & Information with Each Link ! "Arrow War" of 1856-60 AD. After these initial openings, a third round followed, in which all colonial nations, great and small, colluded together in forcing yet more access to the previously secluded Chinese Nation and Empire. As a result at the end of the century, foreign powers dominated business as well as politics within especially the Chinese Coastal regions. The opening of treaty ports would last until the end of the 19Th century, with many treaty ports in service until the end of World War 2 (1945-46 AD). Under the first treaty, the 1842 AD Treaty of Nanjing that marked the end of the so-called"First Opium War" (1840 AD - 1842 AD), five initial ports were forced open. These first Ports were successively Guangzhou (Canton) today Capital of Guangdong Province, Foochow (FuZhou) and Amoy (XiaMen) in current day Fujian Province, and the main ports of Shanghai and Ningbo in today′s Zhejiang Province. In addition Hong Kong (Island) was forced as a Land Lease in perpetuity and is therefor not counted as a treaty port. A "Second Opium War" known as the Arrow War (1856 AD - 1860 AD) more Treaty Ports were forced on China. In the "Treaty of Tien-tsin" which was eventually signed in Tianjin (Tientsin) in June 1858 AD and ratified by Prince Gong, eleven more Chinese ports ware designated for foreign trade and extra-territorial rights for Foreigners. The most important of these 11 harbors were Nanjing (Nanking) in Jiangsu Province, Haikou (Qiongshan) on Hainan Island, Hankou (Now part of Wuhan, Hubei Province), Newchwang (Niuzhuang) - today′s Yingkou in Liaoning Province, Yantai in Shandong Province, and the Danshui District of Taipei (Taiwan). In addition in 1860 AD the city of Tianjin itself was forced open as a Treaty Port, becoming a German Colonial possession and the participating Foreign Nations were awarded the right of "Legation" (Embassy) in the Capital Beijing. Another small but noteworthy extra for the British was the extension of their influence over the No.1 District of Kowloon (south of present day Boundary Street) which was ceded to Britain and became part of the Crown Colony of Hong Kong. Furthermore, in a separate deal the Russians, negotiated their very own separate deal with a weakened China. In return for a seizure of hostilities, on 28 May 1858 AD, the separate Treaty of Aigun was signed with Russia. This treaty to revised the Chinese and Russian border as determined by the Nerchinsk Treaty in 1689 AD so that Russia gained the left bank of the Amur River, pushing the border back from the Argun River. The treaty gave Russia control over a non-freezing area on the Pacific coast, where Russia founded the city of Vladivostok in 1860 AD. Vladivostok would become a major commercial harbor and naval base for the Russian Empire. After its second humiliating defeat and the unequal treaty of Tianjin, it was clear that China was a weak or weakened nation, unable to defend itself or hold on to its territory. While foreign influence slowly infiltrated China and the Chinese rose in anger against their Government and Foreign infringement several times, various Colonial Nations fought to position themselves to carve off and own their own slice of this giant pie. Throughout the rest of the 19Th century (after 1860 AD) more treaty ports were gradually opened throughout China, altogether amounting to over 80 in total. Although the first treaty ports were situated on the Chinese pacific coast, during the third round of expansion treaty ports could also be found inland, mainly along the main rivers of the Yangtze and the Yellow River. In 1876 AD Wenzhou on the coast of Zhejiang Province was opened to the foreign tea trade, but no foreign settlement was ever established there. Designates British Strongpoint, Colonial City or Territory. The last round of the creation of Treaty Ports came after the Chinese defeat in the (1st) Sino-Japanese War and the 1895 AD Shimonoseki Treaty (MaguanTreaty), and a few years later in 1898 AD, after China was defeated by Japan in a short and overwhelming conflict, although strictly speaking a few years previously in 1891 AD Chunking (Chongqing) became the first inland port in China to be opened to Foreigners and International Trade, except for Japanese. Under the Shimonoseki Treaty (Treaty of Maguan (simplified Chinese: 马关条约)) China opened Chashih (沙市) - todays Yingzhou in Hubei Province, Chungking, Suzhou and Hangzhou to Japan. While Japan took possession of the northern half of Korea previously under Chinese protection and penetrated into what today is Liaoning Province, Russia, Japan and the United States of America made use of the moment by dividing up Manchuria (North-East China) into their various spheres of influence. As a result the cities of Harbin, Manzhouli (Inner-Mongolia AR) and Aihun (Arhun) were designated as Treaty Ports in 1898 AD and occupied by various military detachments. Where Harbin became an international city ruled in a shared form by Germany, Russia, Japan and the United States of America, the then towns of Manzhouli and the even more remote Aihun town on the Amur river fell exclusively under Russian influence and Governance. In addition, Lushunkou -what was to become known as Port Arthur at the tip of the Liaodong Peninsula, was taken by Japanese troops in 1894 AD, but through International manipulations ended up in the hands of the Russians who immediately built it into their main Naval Base. Further to the South on the Shandong Peninsula, Germany managed to take away the Kiautschou Bay concession, which then became the German colonial city of Qingdao. (Qingdao was later taken by Japan in 1914 A as part of World War 1). Among the last ports to be claimed and opened were various inland ports along the Yangtze River. For instance, the City of Changsha, Capital of Hunan Province was forced open by Japan under the Treaty of Shanghai in 1903 AD.